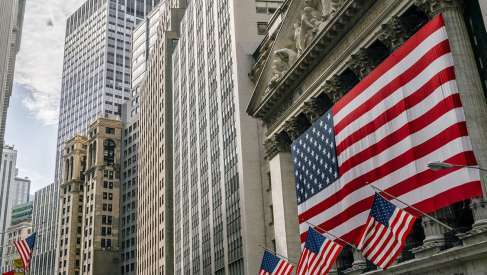 The U.S. Dollar was seen outperforming major rivals on Thursday, April 04 after labour market data easily beat analyst expectations and confirmed to currency market's the world's largest economy remains in rude health. Weekly Initial Jobless Claims from the U.S. Department of Labor read at 202K, well below the 216K that was expected by the market, suggesting the trend of an improving Labour market remains intact. "This is a very welcome surprise, coming hot on the heels of significant downward revisions to claims which suggested that the trend was flat rather than rising, as prior data suggested," says Ian Shepherdson, Chief Economist at Pantheon Macroeconomics. The Dollar appears to have welcomed the data with the currency moving higher across the board in early U.S. market trade. The Pound-to-Dollar exchange rate is quoted at 1.3112, having been as high as 1.3191 earlier in the day before the onset of Dollar buying. The Euro-to-Dollar exchange rate is meanwhile lower at 1.1211, having been as high as 1.1248 earlier. "The U.S. dollar padded its gain after the last look at the job market ahead of Friday’s non-farm payrolls report proved the healthiest in nearly 50 years," says Joe Manimbo, a foreign exchange analyst with Western Union. "Healthy hiring would ease concerns about slower U.S. growth and potentially unlock renewed gains in the U.S. currency." The trend lower in jobless claims is intact. Image courtesy of Pantheon Macroeconomics. "The chart shows that claims have dropped to a new cycle slow, and the trend appears to be falling again," says Shepherdson, adding that his fears claims would start rising as 2018's strong economic performance faded have thus far proved to be too pessimistic. The U.S. Dollar continues to outperform having put in a good showing in the last fortnight, rallying by between 1.5% and 2% in index terms and with the narrow DXY index coming back to within 0.5% of its early March and December 2018 range highs. Stronger data out of the U.S. economy will only help the currency we appreciate as the market rows back from their view that the U.S. Federal Reserve could actually consider an interest rate cut as their next move. Strong data, while not yet enough to prompt expectations for further rate rises, will certainly help push back on expectations for an interest rate cut over coming months.